Print American crossword №14: BOUQUET GARNI free. - My dad works twelve hours a day, so that I can have a comfortable home and decent clothes. My mom spends the whole day cleaning and cooking for me. However, I can not relax from all the worry. - But you are living a fairytale life! What are you so worry about? - Well, what if they try to escape? 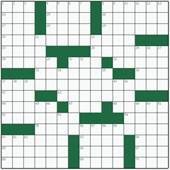 Save the image of crossword to your computer. Then open this image on your computer and send it to print.